Learning disabilities are surrounded by myths and labels based on subjective observations of primary derived behaviors which color our reactions and limit our understanding and ability to intervene. Children with learning challenges have multiple challenges beyond their primary derived behavior. They also have unique strengths. Complex visual-spatial thinking is frequently strong. These challenge areas commonly overlap labels. These additional symptoms are strong enough to have the child earn co-morbid labels at least 50% of the time. Milder challenges still cause the child additional struggle. This phenomenon has led Drs. Martin L. Kutscher, Robert R. Wolff, and Tony Attwood to coin the phrase Syndrome Mix (SM). These different Syndrome Mix labels run in the same families. Labeled kids come more often from families of leaders, entrepreneurs, physicians, engineers and scientists. In ASD, 12.5% of fathers and 21.2% of the grandfathers are engineers. The brain has approximately 50,000 genes defining it, including protein producing and regulating DNA regions. 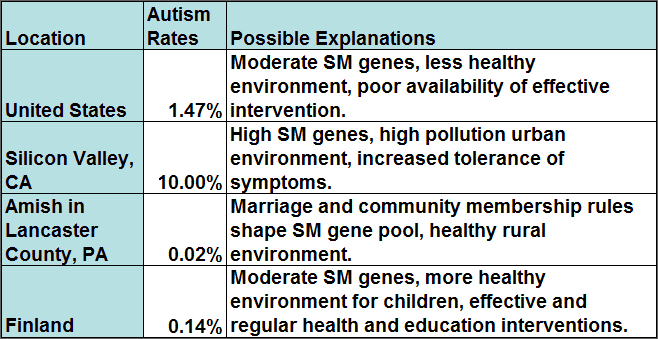 More than 200 "normal" variants or alleles of these SM genes are suggested to cause the Syndrome Mix. The derived behaviors are a product of the interaction of SM genes and the environment. Labels based on subjective observations of primary derived behaviors lead to poor interventions and poor investment in research funding. A Syndrome-Mix Learning Challenge Phenomena model, supported by the currently known facts, is desperately needed. The model must account for the nearly constant overlap of symptoms and explain why some interventions are highly successful in eliminating the derived behaviors while others are less effective. The model above is one such model. Click each piece for more details or use links below. It is intended to guide successful interventions and research, as well as dispel damaging myths. 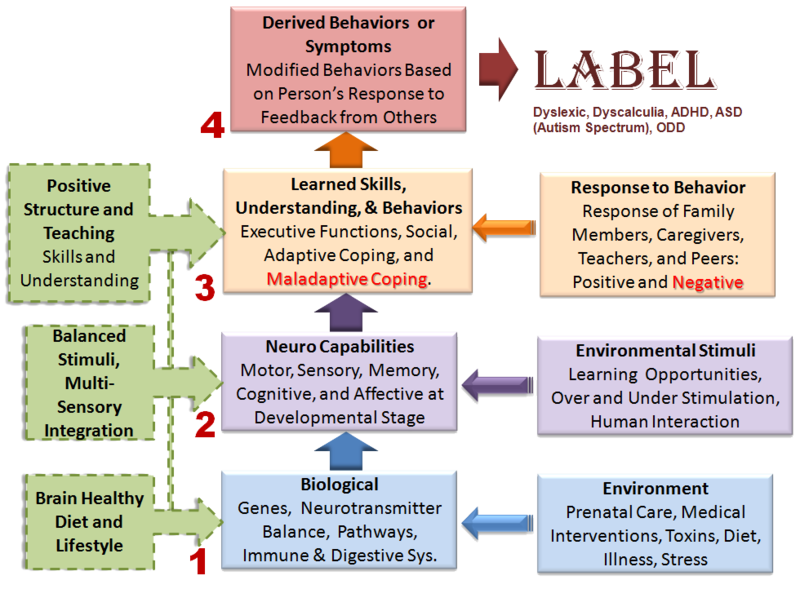 In this 4 level brain-mind-behavior system model, higher levels are emergent properties of the lower levels interacting with the environment. Interventions at each level are proactive actions which promote learning by design. Interventions which primarily target the fourth level of derived behaviors are the least effective. Unfortunately they are most common because they evolved and became established before the science of neuroscience emerged. The American Pediatric Association (APA) recommends an integrated team and intervention approach that is family-centered. This is rarely followed because only the pediatrician is obligated to follow APA recommendations. Parent-Implemented Intervention is recognized as the most effective evidence based intervention for children under 10. Part of the reason why this is true is found in the neuroscience of the oxytocin neurotransmitter. Again, although well established and known by the experts, it is only followed by a small group of developmental neuroscience based programs. Using this model, effective understandings and intervention on focus on lowest level first, then work up. This is especially true for new negative behaviors. We encourage others to adopt this model or counter with other models that comprehensively explain the currently known facts of the Syndrome Mix of Learning Challenges. This way, effective interventions and research can move forward. For parents of children with the Syndrome Mix of Learning Challenges, this site seeks to increase understanding and skills to aid your child and family. We strongly encourage you to follow APA recommendations and find or develop a family-centered integrated theraputic team led by a Developmental Neurologist, an advanced pediatric specialty, or nurse practitioner guided by a Developmental Neurologist. We also strongly encourage you to find or develop a Sharing Care Network.